I received this at my Baptism. The majority of the cover is of some sort of cliff face and a silhouette of a man jumping across. The cover sums up the book in a simple way. 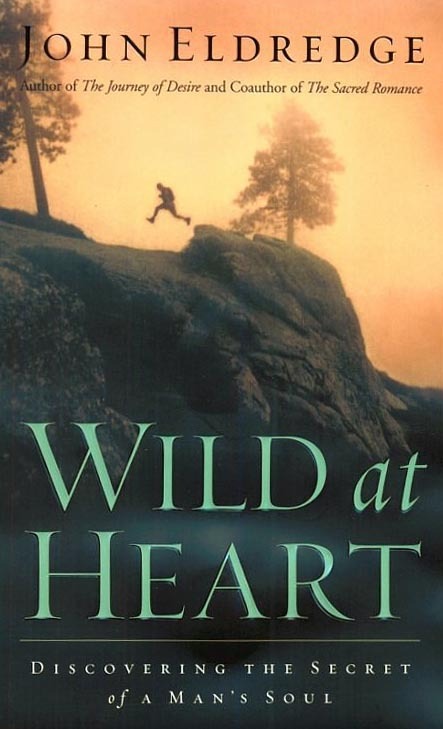 The book is all about being "wild at heart"! The book talks all about "discovering the secret of a man's soul". Whilst the author, John Eldredge, goes into great depth about a man's need for adventure, their naturally wild heart, and why we need to be set free, the points of application were nowhere to be found in the early chapters. Only until halfway are we introduced to our enemy, and the remaining deals more convincingly with what we can do. I have to say the whole book feels pretty much like a plateau, and there isn't really any ups and downs... so it didn't make as exciting a read as I thought (given the title). Having said that, many of the points in the book were very insightful and I could relate to aspects of it. -Be who we want to be not what the world wants us to be. -Men are naturally wild at heart. -The Devil uses guilt to make us stumble. The way the book is set out is clear and split into chapters and then sub-chapters, and split so that it is not a chore to read. I personally read about a chapter a day which meant I could think about what I read and so on. The only criticism is that it really does leave you hanging and not really knowing what to do... there are vague ideas but not really substantial.... I guess we can't be TOLD what to do, and we have to explore for ourselves and only through our relationship with God can we truly find this out... I just feel like after reading this that I am slightly lost, not really knowing if I should continue with my own dreams or whether to pick up this epic adventure I could apparently be living! Although it mainly focuses on the heart of a man, it is a book for women as well. It talks about a woman's heart in some depth and allows the man to understand the woman more. In this way, a woman reading this book can also find out about a man's heart. I think the book is inspirational and insightful, but lacks in application points. It is quite encouraging and I'm sure many will be excited and urged to do something exciting and break free from their mundane lifestyle.